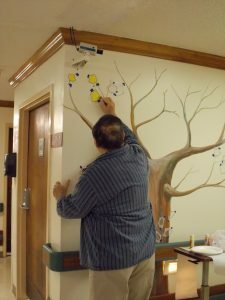 Posts Tagged "quality of life"
Since 2011, three states have provided funded registration for this training to hundreds of nursing home employees through the support of CMP funds. This year, Oklahoma is stepping up to the plate by welcoming geriatrician and award-winning author Dr. Al Power to facilitate three Dementia Beyond Drugs events in May 2015. A group of Elders at Denali Center recently started a Recognition Task Team to celebrate and thank specific staff for the work that they do. One elder shared with a staff member who was having a rough day that she needs to receive, as well as give, and find balance. Sometimes amidst the chaos, there are moments of clarity, when we’re reminded why we do the work we do. I had one of those moments last October, during one of those speaking engagements when you’re not sure anyone really cares what you have to say. Can Old Dogs Learn New Tricks? Is It Live, or Is It Memorex? Denise Hyde on Is It Live, or Is It Memorex? Carmen Bowman on Is It Live, or Is It Memorex? Marianne Taylor on Is It Live, or Is It Memorex? The Eden Alternative® is an international, non-profit 501(c)3 organization dedicated to creating quality of life for Elders and their care partners, wherever they may live. Through education, consultation, and outreach, we offer person-directed principles and practices that support the unique needs of different living environments, ranging from the nursing home to the neighborhood street.